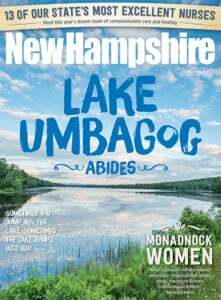 There are many things to love about New Hampshire besides the beauty of the landscape and our rugged independent spirit. For example, the 25 companies listed here, each making iconic things that have in some way defined the Granite State’s unique allure to the world. Not to get all mushy, but consider this a short list of our Valentine’s Day gifts to the world. If you’ve ever eaten a French fry or a donut (and really, who hasn’t?) chances are good it was cooked in a Pitco Frialator. It was back in 1918 that J.C. Pitman founded the company that now operates in Bow and Concord. They make not only fryers but pasta cookers, rethermalizers, oil filtration systems, charbroilers and griddles. Pitco equipment is used in many of the top chain restaurants throughout the United States, as well as in over 100 countries worldwide. It started back in 1993 when contractor Bill Whyte wrestled with how to ease the painful cracking and bleeding of his winter-induced dry hands. Nothing then on the market helped. He experimented with olive oil and then beeswax on his kitchen stove and found a formula that worked. In the years since, Whyte and his family have built a whole line of certified organic body care products — from the original hand balm to sunscreens to bug repellents. Located in rural Gilsum, the company strives to be environmentally, socially and economically responsible. In fact, it’s now a certified “B Corporation,” a new type of company designed to encourage businesses to be more accountable in the workplace. There are a million baskets on the market, but the ones handmade by the craftsmen at Peterboro Basket Co. are in a class of their own. The family-owned and -operated company uses techniques that have been perfected over the 159 years they’ve been in business. Set in the heart of Peterborough, it’s become an industry leader with an online store that sells a myriad of baskets — for bicycles, knitting, pies, picnics and more — to people all over the world and locally in their factory outlet. Each of their baskets has a distinctive metal tag attached. The website brags that this Ashland company has been “in continuous business since 1922,” which is saying something when your namesake product is something you mostly remember finding in your grandparents’ closet. But along with cedar shoe trees, the company has diversified to offer shoe care products and a variety of other cedar wood items like wine racks and suit hangers. Oh, and boot jacks. How’s that for staying relevant? Hampshire Pewter, based in Wolfeboro, is the only manufacturer in North America that still hand-casts all of its pewter products. These one-of-a-kind pieces created by the company’s artisans range from goblets and tankards to jewelry and oil lamps. Though all of their items are lovely, it’s the gorgeous Christmas ornaments that are world-renowned, made famous by many years of making special ornaments for the White House’s Christmas displays. Who knew? One of the premier high-performance engine shops in the world operates just off the flight path of the Manchester-Boston Regional Airport. Specializing in American V-Twin performance engines, R&R Cycles manufactures all parts and engines in-house using aerospace-quality precision computer-driven shaping so their motors don’t require gaskets. Backyard bird feeding is a populist passion — the second most popular hobby in America. Here in NH it’s a passion shared with people by a burgeoning black bear population. So maybe it’s fitting that Duncraft, founded here in 1952, is the pioneering company in keeping up with demand for durable products and innovations designed to get the right seeds to the right critters. The Dunn family has kept the business close to home and close to the hearts of bird lovers with their signature window feeders and delightful new designs for more than 400 products made in Concord. All right, so the Segway didn’t quite revolutionize the everyday world the way New Hampshire inventor and entrepreneur Dean Kamen hoped it would, but there’s no denying the two-wheeled, self-balancing, battery-powered personal scooters (built in Bedford) are a huge step forward in green transportation. These days major cities and museums (like the Smithsonian) offer Segway tours (you can even take an “off road” Segway tour at Gunstock Mountain in Gilford), police forces and security teams at colleges and businesses around the world use them for patrolling and crowd control and now Segway Robotics offers unmanned ground vehicles with research, navigation planning, industrial automation and even defense applications. What began as a sweet idea to make guests feel at home at the Josiah Bellows House B&B in Walpole — a plate of fresh baked cookies in every room — grew into the Bellows House Bakery and there’s been little room for guests ever since. In 2013 alone, Lois and Lou, with a staff of 12 (plus good equipment, high efficiency and divine intervention, says Lois), have produced and shipped three million of their cookies, brownies and scones to customers all over the world. The original mission wasn’t forgotten since getting a selection of their treats in the mail does make any place feel a bit more like home. Global in scope with facilities in the UK, Belgium, Spain, Switzerland, the Czech Republic and Singapore, Lonza Biologics Inc. opened shop in Portsmouth as an anchor industry for the Pease International Tradeport during its early years. Their mammalian cell cultures and monoclonal antibodies are the raw material of biomedical engineering and the active ingredient of numerous biopharmaceuticals. The actual “product” they manufacture (or grow) at Lonza is protein complexes with a molecular weight that falls somewhere between peptides and viruses. In short, it’s a giant company that makes microscopic stuff. It was in the Swiss mountains that George de Mestral got the idea for a super-strong fastener. On a hike with his dog, the two became covered with spiny cockleburs. Fascinated by how hard they were to remove from his clothing and his dog’s fur, he studied them under a microscope. He found it was a “hook and loop” configuration that made the plant so tenacious. Seeing its potential as a fastener, he began production of hook and loop fasteners in 1955 in Europe and Canada, finally moving the company’s headquarters to Manchester. The name of the company and the famous brand come from the combination of the words “velour” and “crochet.” Now a global company, Velcro Industries sells its products into many industries — aerospace, sports and clothing to name just a few. A lot has changed since the post-WW II industrial boom, but New Hampshire Ball Bearings Inc. has been doing its part to keep the wheels of industry rolling smoothly since it was founded in Peterborough in 1946. They make precision bearings and complex bearing assemblies for the aerospace, defense, medical, dental and high technology markets, but the 10-year-old boy in all of us just wants to take them all apart and carry those smooth spheres and shiny rollers around in our pockets. Some of the world’s finest hand-cut crystal can be found at Pepi Herrmann’s Crystal in Gilford or at his online shop. When the Austrian-born Herrmann migrated to the US in 1968, he used his mastery of crystal cutting (he’s one of the few independent Master Crystal Cutters in the country) to revive the long-faded Brilliant Period (1890-1915) of American cut glass. He is considered a pioneer in bringing back the exquisite deep cutting of that era. He crafts everything from crystal flutes and goblets to vases and ornaments. It’s the largest manufacturer of paper book matches in North America. The D.D. Bean & Sons Co. — operating continuously in Jaffrey since 1938 — makes matches for national and generic labels that are both sold and given away at thousands of retail outlets throughout the US and Canada. When the company started, paper book matches were becoming more popular than wooden matches, and Delcie David Bean and his two sons realized the advantage of printing advertising on the covers and set up a factory that was able to produce high-quality matchbooks in large quantities and at high speed. Photo courtesy of D.D. Bean & Sones Co.
Peter Limmer and Sons Inc: Limmer hiking boots — painstakingly custom made for the last 64 years in Intervale — are in such demand that people who purchase them have waited up to three years for their pair to be made. It’s become a tradition for fans of the legendary boots from all over the world to snap a photo of themselves (or mostly just the boots) in some distant locale and send it to the company. In the mid-1970s, to accommodate the swelling backlog of customers who didn’t require a boot that was custom made, the Limmer family decided to add a line of boots that are mass-produced but are still high quality. Not many products appeal to both the outdoor spirit and the inner-city mind set so completely as do Timberland’s classic boots — the flagship product of Stratham’s (and, arguably, NH’s) most famous company. Not trying to start a rap war with Limmer (cue the beats), but if boots could talk it might go down something like this: Yo, Limmer, you’re a legend on the mountainside, but Timberland is famous for its golden hide on the streets of New York City and Brooklyn Heights. ‘Cuz everywhere you go they’re waterproof and tight, and you know that someone’s rapping to a different beat when you see our leather wrapped around Rhianna’s feet.